Partly Cloudy, and 83 ° F.
Effective Monday, January 28, 2019, bus stops will be realigned due to the State of Hawaii, Department of Transportation’s Farrington Highway Repaving Project. 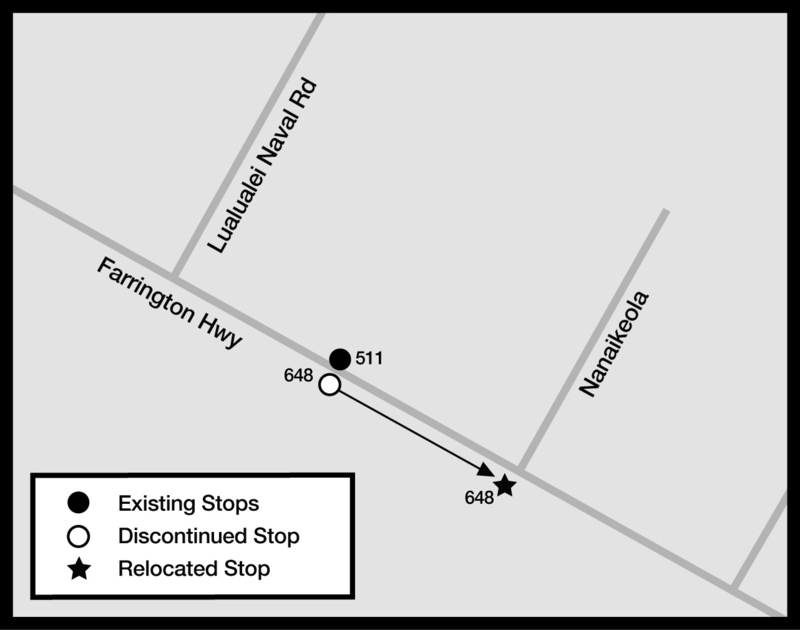 · Bus Stop #642 will be relocated to farside Hakimo Rd. · Bus Stop #644 will be relocated to nearside Princess Kahanu Ave. Note: Rt. 403 eastbound will no longer service bus stop#644. Board Rt. 403 at Bus Stop # 4302 Princess Kahanu + Farrington. The bus stop located at 9th Ave. / Pakui St. (stop #3035) eastbound, will be closed 24 hours day/7 days a week starting on TUESDAY, JANUARY 15, 2019, UNTIL FURTHER NOTICE. Passengers may board buses at the portable placed 100 feet forward of the original stop. No service 9th Ave./Pakui St. eastbound (stop #3035). 24 hours day / 7 days a week unless directed by Police. The bus stop located at Kamehameha Hwy./Opposite Radford Dr. (Stop #699) eastbound will be closed beginning THURSDAY, DECEMBER 20, 2018, 24 hours a day, 7 days a week, until further notice, due to rail construction. Passengers may board buses at the portable bus stop located 100 feet west of the original stop. No service at Kamehameha Hwy./Opposite Radford Dr eastbound (stop #699). NO DETOURS will be necessary. Effective Wednesday, October 17, 2018, the following bus stop on Farrington Highway, eastbound, will be moved from the farside of Lualualei Naval Road to the nearside of Nanaikeola Street. The stop description will be changed from Farrington Hwy + Opp Lualualei Naval Rd to Farrington Hwy + Opp Nanaikeola St. Effective Wednesday, September 5, 2018, the following bus stop will be permanently closed. The bus stop located at Nimitz Hwy./Elliott St., eastbound, (Stop #702) will be closed starting on WEDNESDAY, AUGUST 8, 2018, 24 hours a day, 7 days a week, until further notice. Passengers may board buses at the portable located prior to the intersection of Nimitz Hwy/Elliott St. or on Elliott St prior to Nimitz Hwy. 24 hours day, 7 days a week unless directed by Police. The bus stop located at Nimitz Hwy./Valkenburgh St., eastbound, (Stop #701) will be closed beginning THURSDAY, MAY 17, 2018, 24 hours a day, 7 days a week, until further notice. Passengers may board buses at the portable located prior to the intersection of Nimitz Hwy/Valkenburgh St. or at Nimitz Hwy/Elliott St. The westbound bus stop at the ARIZONA MEMORIAL (Stop #4322) will be closed starting on TUESDAY, APRIL 17, 2018, 24 hours a day, 7 days a week, UNTIL FURTHER NOTICE. Westbound: TheBus will travel the regular route to Kamehameha/Halawa, continue along Kamehameha, and then resume the regular route after crossing Kalaloa. The eastbound bus stop located at Hotel St./River St. (stop #125) will be closed 24 hours day / 7 days a week, starting on FRIDAY, FEBRUARY 9, 2018, UNTIL FURTHER NOTICE. Passengers may board buses at the portable placed 50 feet after the stop. No eastbound service at Hotel St./River St. The bus stop located at Kalanianaole Hwy./Opposite Poalima St.(#1247), will be closed 24 hours a day, 7 days a week beginning WEDNESDAY, DECEMBER 20, 2017, until further notice. Passengers may board buses at the portable located 150 feet prior to the stop. No service at Kalanianole Hwy./Opposite Paolima St. The bus stop located at Farrington Hwy. at Leoku St. westbound will be closed beginning THURSDAY, June 23, 2016, 24 hours a day, 7 days a week, until further notice due to rail construction. Passengers may board buses at the portable bus stop on Farrington Hwy., 200 feet west of the Farrington/Leoku intersection. Route 434 passengers may board at Leoku/Opposite Leolua. No service at Farrington Hwy./Leoku bus stop, westbound. The bus stop located at Kalanianaole Hwy./Opposite Flamingo St.(#1250), will be closed 24 hours a day, 7 days a week beginning WEDNESDAY, July 20, 2016, until further notice. Passengers may board buses at Kalanianaole Hwy/Opposite Kumuhau (#1249). No service at Kalanianole Hwy./Opposite Flamingo St.